Create The Life You Want Now! I love to dance. I started with ballet as a child, and in more recent years, I’ve explored ballroom dancing and belly dancing as well. 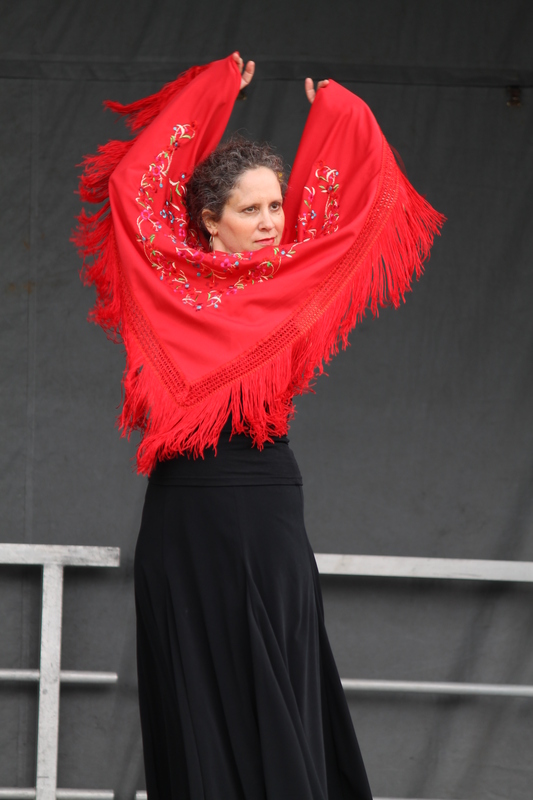 For the last eight years or so, I’ve been immersed in the world of flamenco dance. I fell in love with Spanish guitar (particularly flamenco guitar) many years ago when I lived in Spain. To have the opportunity to learn flamenco in the city where I live has been a dream come true. Our flamenco group, known as Sol y Sombra (Sun and Shadow), has waxed and waned in terms of faces and numbers over the years, but we’re all drawn together by our passion for the intense expression of movement, emotion and rhythm. Staccato footwork, arms that snake enchantingly upward, hands that suggestively caress the contours of the female body, long flowing ruffled skirts in myriad colours and patterns, and music that evokes the full range of human experience – anguish, ecstasy, lust, betrayal, joy, sorrow, loneliness and union. We perform at different locations during the year. This past weekend, we danced as part of a Latinfest celebration at The Museum in downtown Kitchener. We did two shows and, while the faces in the crowd changed, one thing remained the same – the excitement in the faces of the women in the audience. We danced on the floor right in front of where the chairs were set up, so we were close enough that we could have touched individuals in the front row. Sometimes when we perform, it’s on a stage and we’re more removed from the audience so it’s harder to see their expressions. On Saturday, however, there was no denying the delight and pleasure in the faces of young and old alike. It made me realize why I enjoy performing so much. Every time we dance, I notice someone in the audience, usually a woman, who is sitting on the edge of her seat, oblivious to everyone else in the room, completely captivated by the sound, the movements, the life stories that are being embodied in front of her. As the show progresses, I’ll notice that she’s sitting taller, her eyes are glowing, her face is flushed and she has a radiance, an energy, a presence that was not there when she first arrived. Flamenco’s message has touched her and, while that message is unique to each person, its essence is one of empowerment. We’re often approached after a performance by these people, seeking to learn more, perhaps take classes, but mostly just to prolong that feeling of personal power, meaning and purpose. Passion does that. It inspires you, and those around you, to become more than you ever thought you could be. Thanks to Michelle Turner for the incredible photo! Be inspired to dream bigger! Enter your email address to receive new posts by email. 20,000 Kms and Still Going!